The M.G. 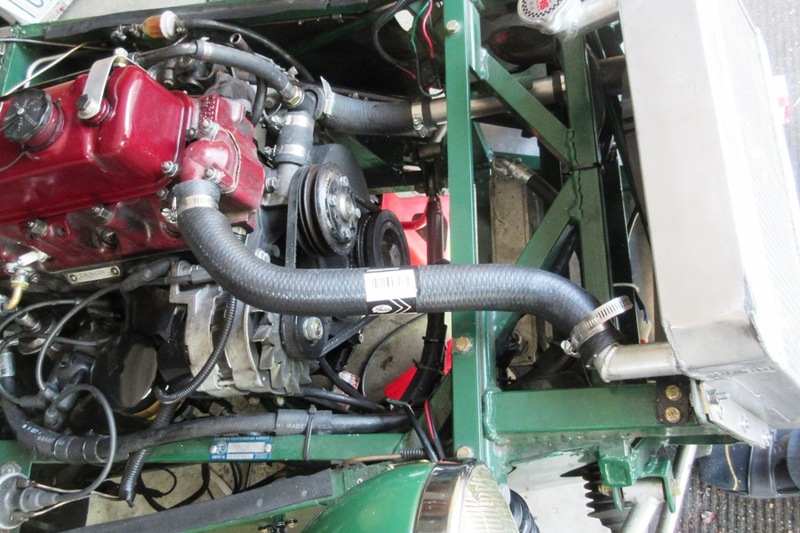 Locost is back on the road and running better than we ever imagined. Okay, not really. We always imagined it would run this well. The refreshed engine makes gobs of power, which is not a technical unit but is somewhere between 'a lot' and 'zillions', and oil pressure never drops below 60 psi on the road. So it's all been pretty exciting, but the most amazing thing about our new engine, which admittedly has only been new for about a week, is that we haven't added a drop of oil since getting it back together 382 miles ago. I know, we can't believe it either. 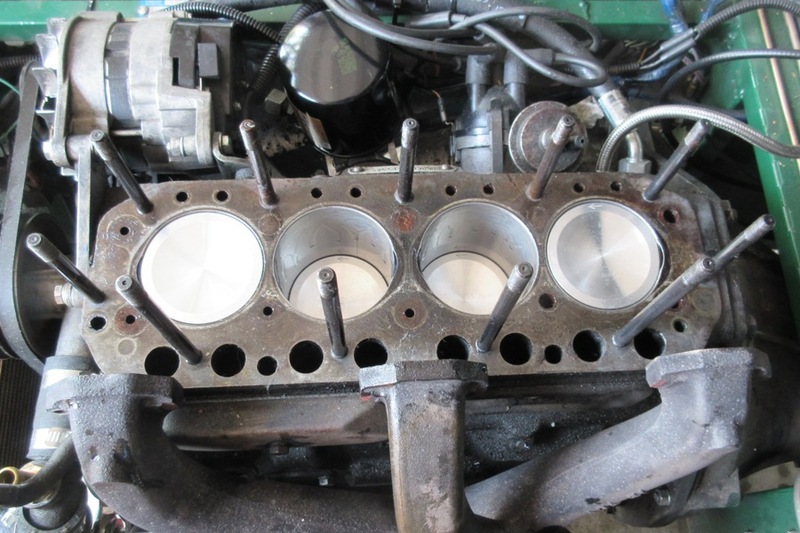 Reassembling the engine was probably the one task in this month-long, three-ring circus act that we actually felt confident about, except for honing the cylinders, which we'd never done before, not that we ever let that stop us. We did watch a bunch of YouTube videos on honing, just to see if we were on the right track, and it looked simple enough but that turned out to be an optical illusion. 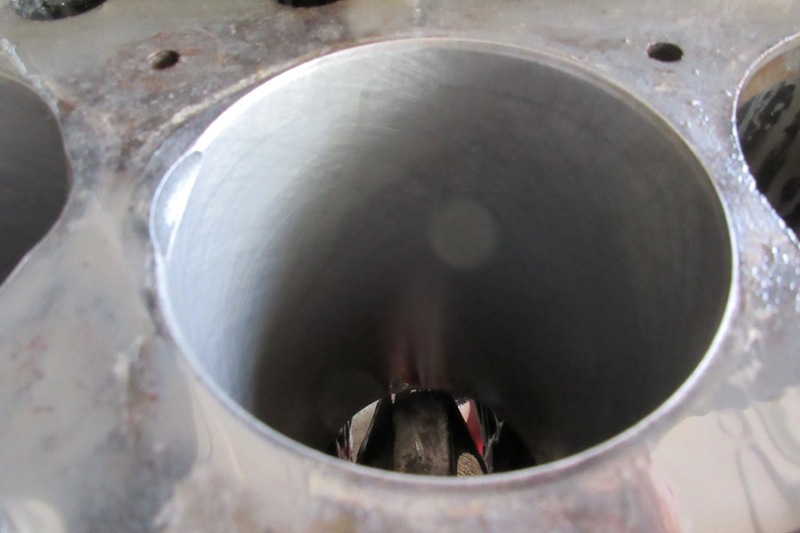 It seems to take a fair amount of skill to get the right cross-hatch pattern, which has to be around 30-45 degrees or the engine will blow up, according to the Internet. After a few uncoordinated attempts to get the proper drill speed and up-and-down motion of the hone, we managed to do a pretty nice job on at least two of the four cylinders, and an okay job on the rest, at least by Internet standards. Based on how well the rings seem to be working, we think we did okay. 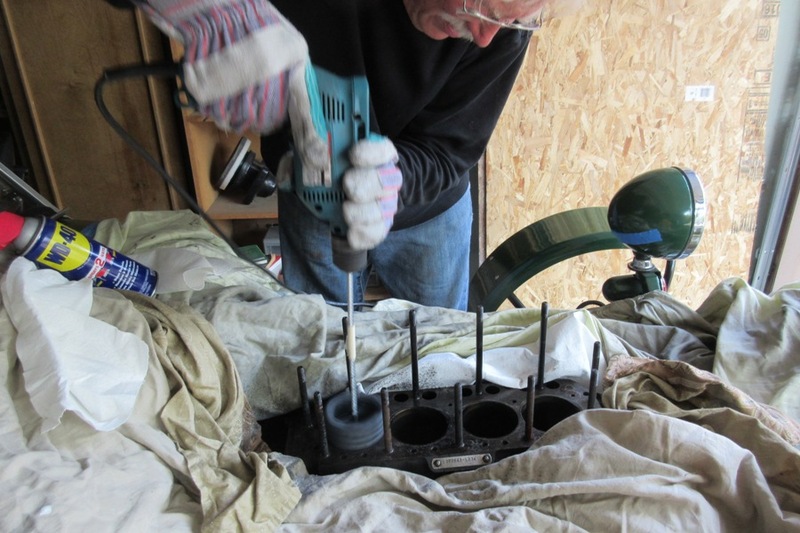 We also found that honing leaves behind a sticky gray paste that makes an excellent grinding compound, so it has to be totally cleaned off the cylinder walls with soap and water from a hose, plus lots of engine oil and WD-40, or the engine will blow up. We think we got it all. Time will tell. We didn't mention this earlier, because we didn't know, but minutes before bolting on the oil pan we decided to replace the main crankshaft bearings, or at least the middle three that we could reach. We did this because of the sad shape of our rod bearings, which admittedly have a harder life than the mains, but if the rod bearings were bad the mains had to be at least a little worn, and also because replacing the main bearings is super easy, except for the part where you lie on your back under a greasy engine for two hours, and the part where you have to pay for them. The mains turned out to be just as bad as the rod bearings, and it didn't slip our notice that the worn bearings could have been the result of an oil leak we experienced last year when we tore a hole in one of the oil cooler lines. We check the oil pressure gauge fairly often when we're driving, and we certainly did when the oil line burst, but maybe not at the exact moment the oil line burst. When we looked at the gauge it read zero, and no telling for how long. 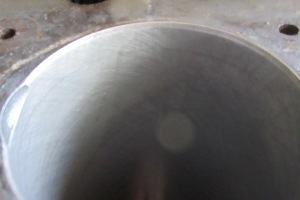 So the outer main bearings probably need replacing as well, but you can't do that with the engine in the car, so we'll deal with them at some future date. Interesting side note, and yes, interesting only to us, we actually had to refer to our Locost Workshop Manual when we reassembled the car. Not because we couldn't figure out how everything went back together, because we totally could, but because the upper radiator hose was damaged in the disassembly process, and had to be replaced. Our comprehensive workshop manual listed the exact part number for the hose, and our local O'Reilly Auto Parts had it in stock. So the thousand or so hours we spent on that workshop manual, not totally wasted. As confident as we were about getting the engine back together, we were pretty sure it wouldn't start when we tried to fire it up, as that would've required more luck than we've come to expect. We stressed about this a lot when we were installing the pistons, more after the oil pan was bolted on. We've had the head off the engine before and the car always started up afterwards, but this was different. We had the guts of the engine spread out all over the garage. We held the pistons in our hands. Dozens of parts, and they all had to go back in exactly the right configuration, and what are the odds of that? After bolting everything on, the last thing we did was connect the choke and throttle. We took our time, hoping to delay the inevitable, but eventually we reached the moment of truth. We first tried turning the engine with the ignition off, and were pretty excited that it actually spun, less so that the oil pressure didn't budge from zero even after 20 seconds. Thinking the engine probably wasn't spinning fast enough, and with nothing left to lose but our brand new pistons and bearings, and probably the crankshaft and block as well, we hooked up the ignition and turned the key. 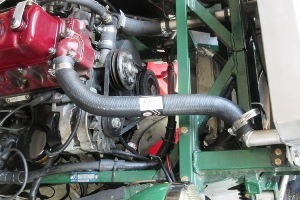 The engine caught on the first rotation, and quickly settled into a smooth idle. Five long, tense seconds later the oil pressure gauge started registering, and then quickly climbed to 90 psi. We let the engine idle for about ten minutes until it was up to temperature, then took a short drive to the local 76 station to fill the car with gas. We were light on the throttle the whole way, but even with the break-in restrictions the extra power was obvious. Getting used to the power was easy. The oil pressure gauge, not as much. Even now, it still looks strange seeing the needle that high. Most of the 382 break-in miles were driven without a proper bonnet. Or any bonnet. We did fold up a new bonnet as promised when the engine was all in pieces, and we were quickly reminded of just how much work it is. Thick .050" aluminum sheeting does not want to bend by hand. Unfortunately, hands are all you've got until the edge is pushed over far enough to clamp a length of angle iron on top and squeeze it down. This process results in creases that aren't exactly what you'd call crisp, but at least they're straight this time. And not as lumpy. 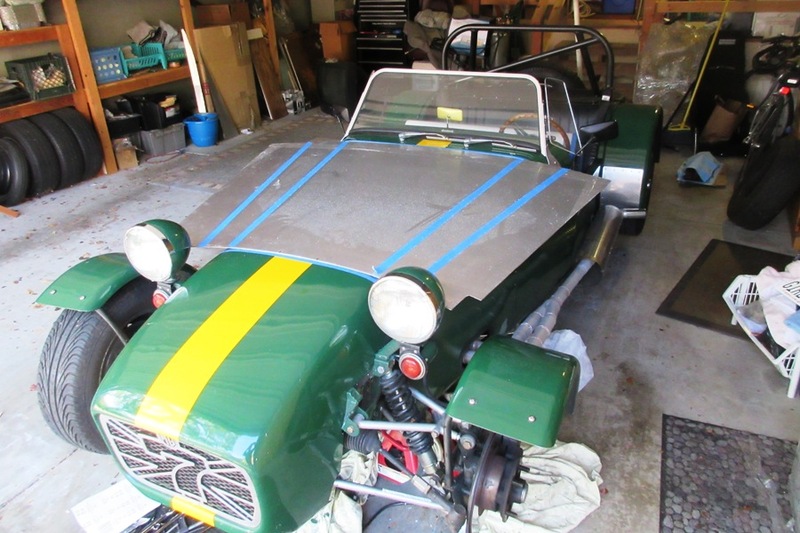 We thought we got lucky with the first bonnet when it turned out to actually fit the car. Not a perfect fit of course, but okay in photographs. The front always stuck up a little higher than the nose, not a good look. We tried flattening it a few times, but apparently once you bend aluminum, it remembers. The passenger side also bulged out a little, maybe a quarter inch. Nothing we could do about it once the bottom channel was folded up. Fortunately, we managed to eliminate both of these fitment issues on the new bonnet, and only created a couple of new ones. The new bonnet feels a lot lighter than the old one, which seems to indicate that our giant fiberglass hood scoop must've weighed a ton. A mistake we won't make again. We could probably make a lighter scoop for the new bonnet, but not a less ugly one, so we're not even going to try. All in all we're pleased with the way the new bonnet looks. 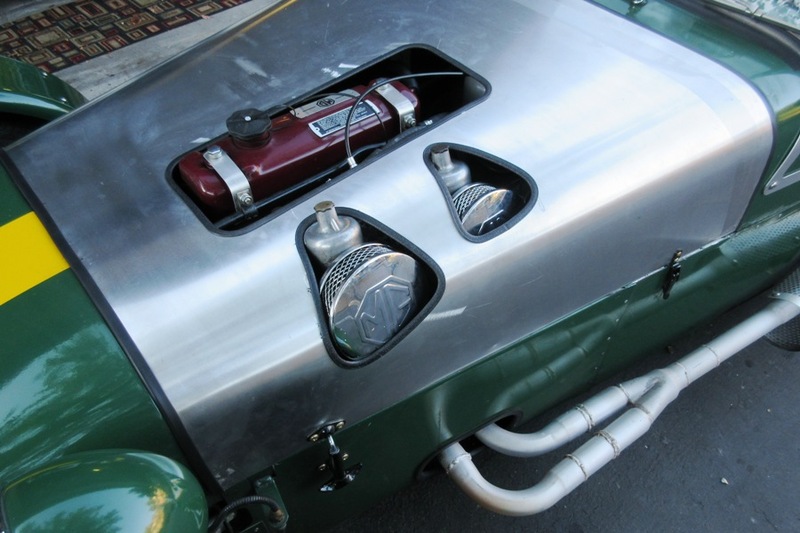 Even the holes for the valve cover and carburetors turned out better than they did on the old bonnet, if for no other reason than back then, as we've established many times, we didn't actually know what we were doing. Our original bonnet was the first piece of bodywork we made for the Locost, if you don't count the scuttle sheeting, which we don't because it was steel and didn't require any real shaping. We learned a couple of things while making the bonnet, the first of which was not to use wood for a metal brake, regardless what it says in the Locost book. That's just stupid. Wood is soft and it splinters under load. Angle iron is the way to go. The second thing we learned is not to cut every hole in the bonnet by guessing its location. 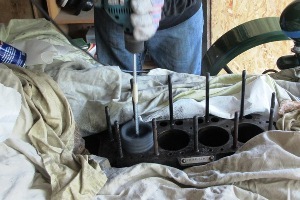 On the first bonnet, the valve cover hole came out okay, but the carburetor holes were off. 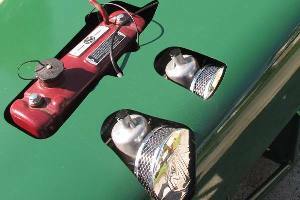 We fixed them by cutting even larger holes, but we were never happy with the results. If we'd known better, we would've cut the holes in our paper template first, then made any necessary adjustments with tape and scissors, and finally used the template as a guide on the actual bonnet. Why we figured it out this time is a mystery, but we're glad we did. 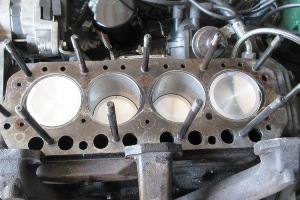 The carburetor holes are smaller, and the parts of the engine that stick up through the holes are a lot less noticeable. 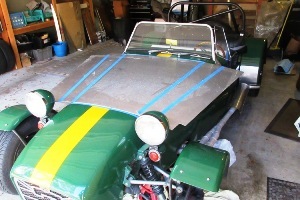 The new bonnet is not yet painted, but that's just a matter of finding the time and place to paint it. 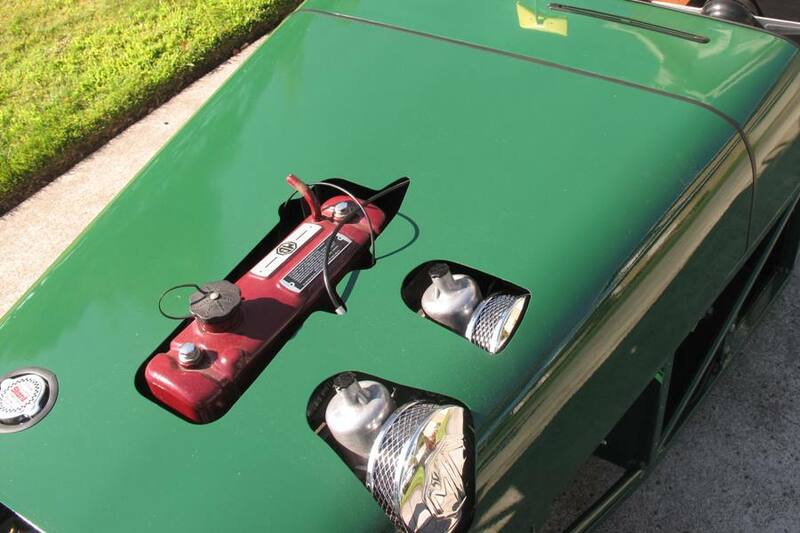 It's too big to shoot with a rattle can, unless you totally don't care how it looks, and shooting it with a spray gun will end up tinting everything in a three-block radius a light shade of Rustoleum Hunter Green. We would prefer to avoid that this time. The phone calls alone. We're tempted to use the foam roller method, although we've heard it's a lot of work. We're not afraid of a little hard work, but we are slightly afraid the results might not be worth the effort. 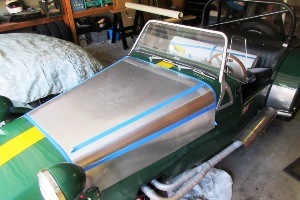 Meanwhile we are driving around with the unpainted bonnet attached to the car, confident that it can't possibly fly off thanks to the advanced design of our secure new hood latches. Provided we remember to latch them. We didn't think the car could be any more fun to drive than it already was, but that extra torque feels like five guys back there pushing. Used to be we could deke most people off the line, but only if we played it casual and timed it right. Now we can let them have a head start. It's effortless. Not for the tires, though.